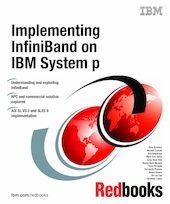 This IBM Redbooks publication will illustrate the installation procedures of InfiniBand on the IBM System p5 with Linux and AIX 5L. InfiniBand adapters, switches, and network management software will be described in this publication. The IBM HPC stack will be tested with InfiniBand (Parallel Environment, LoadLeveler, GPFS, ESSL, and Parallel ESSL). Communication protocols such as MPI and LAPI will be tested and observations will be illustrated in this book. This book is the complete guide on how to implement InfiniBand on the IBM System p5. It is targeted at all IT professionals looking to understand what is behind the InfiniBand technologies, how to deploy it, and what is the IBM solution incorporating this technology.